In its first week of Colonial Athletic Association conference play, the Drexel University women’s soccer team tied Northeastern University 1-1 and defeated The College of William & Mary 2-0. Both contests were played on Vidas Field, which is Drexel’s home turf. The Sept. 21 Northeastern game was a rematch of last season’s CAA Women’s Soccer Finals, where the Huskies defeated the Dragons 3-0. Drexel also lost to the Huskies 1-0 at home in overtime last season, so Drexel was looking to avenge its misfortunes from a year ago. 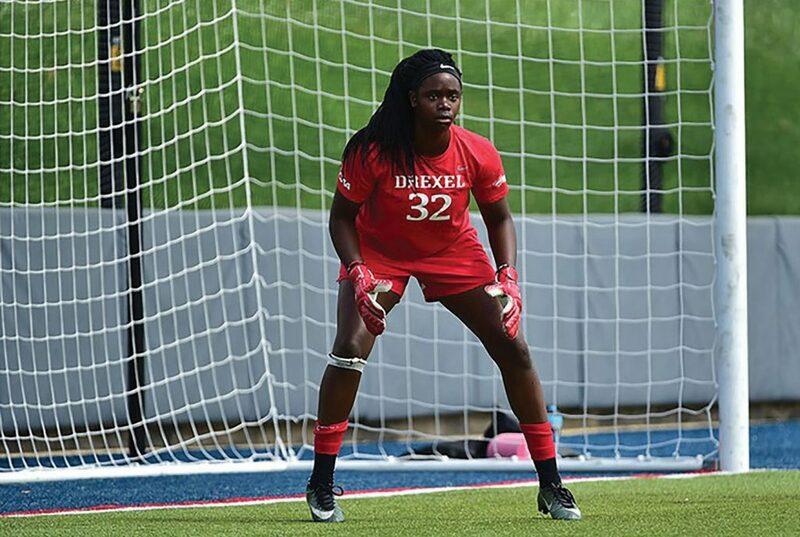 Despite the fact that Northeastern’s offensive attack dominated for the entire game, Drexel was able to earn a 1-1 tie due to the record-setting heroics of senior goalkeeper Christiana Ogunsami. The Huskies outshot the Dragons by a significant margin (36 shots by Northeastern, 15 by Drexel), but Ogunsami saved 20 of the Huskies’ attempts, which was not only her new career high, but also a new CAA single game record. In the first half, neither team managed to find the back of the net. By halftime, Ogunsami had already picked up eight saves and was on pace to break her career high, which was 15. Drexel scored first in the 47th minute when senior Madison Dunn headed in a corner kick that came from senior Wilhelmina Hauch-Fausboll. The ball never touched the back of the net, as the Huskies cleared it away when it entered the goal. However, the referees ruled that the ball had crossed the goalline before it was cleared away, and Dunn was awarded her second goal of the season. It was only a matter of time, however, until the Huskies evened the score. In the 65th minute, junior Hannah Rosenblatt scored for Northeastern to even the game at 1-1. It took 24 combined shot attempts, but the Huskies finally got a ball past Ogunsami. Rosenblatt has become a Dragon slayer, as it was the third consecutive game against Drexel in which she managed to score a goal. Neither team was able to score another goal in regulation, and for the second straight regular meeting, the game went into overtime. Ogunsami finished regulation with 15 saves, which tied her career high that she set at Vanderbilt University, but she wasn’t finished there. In the first period of overtime, Ogunsami saved four more shots and singlehandedly kept the Dragons in the game. Ogunsami picked up her 20th save in the second period of overtime, a period in which Drexel’s offense managed to put two shots on goal. However, both of Drexel’s shots were stopped, and the game ended in a tie. Following the draw with the Huskies, Drexel played host to the William & Mary Tribe on a blistering 90-degree day Sept. 24. Neither team scored in the first half, but the Dragons got on the board first just a few minutes out of halftime. In the 47th minute, freshman Raenah Campbell scored a header off of an assist by junior Shaelyn McCarty. It was Campbell’s second goal of the season. The Dragons clung to a narrow 1-0 lead for most of the second half. However, junior Vanessa Kara finished off the Tribe with a goal in the 86th minute. After senior Imani Walker played a long ball forward from the middle of Drexel’s half of the field, Kara turned on the jets and beat two defenders to the ball, took two dribbles and beat William & Mary’s goal one-on-one. It was the 21st goal of Kara’s career, which moved her into sole possession of second place on the Drexel all-time goals list. Drexel held the Tribe off the board and came away with a 2-0 victory. Ogunsami finished the game with five saves. With the win, the Dragons improved to 6-4-1 on the season. Thanks to the win and the tie, the Dragons have four points in conference play, where they are currently tied for third with Northeastern. Drexel’s next game will take place on the road against Hofstra University Sept. 28 at 7p.m.